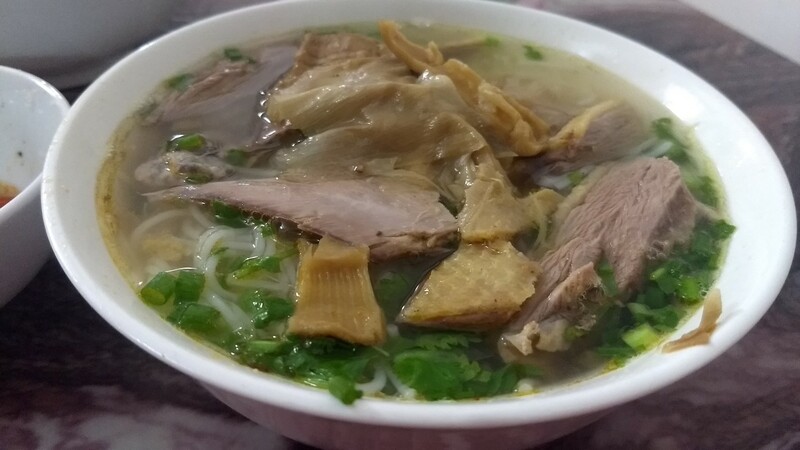 While enjoying Bia Hơi on our first night in Hanoi, one of the people we chatted with mentioned an amazing duck soup they had found in a nearby alley. Following their directions, we ended up in Ngõ Trung Yên Alley for lunch the next day. 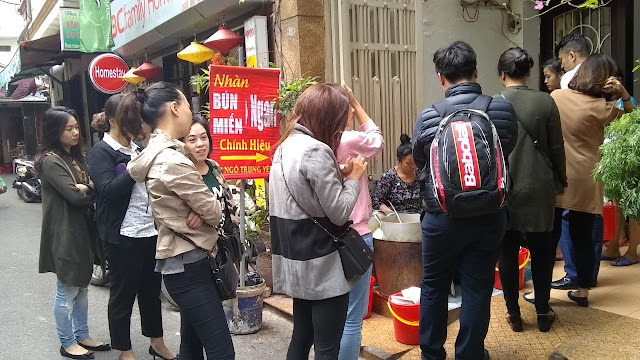 Finding the stall, which is called Bún Ngan Nhàn, turned out to be easy - just look for the line and the lady sitting out front busily ladling up steaming bowls of soup. The soup base was amazingly flavorful, and the duck was delicious. The duck lady sets up in front of a small shop that sells drinks to go along with your meal. 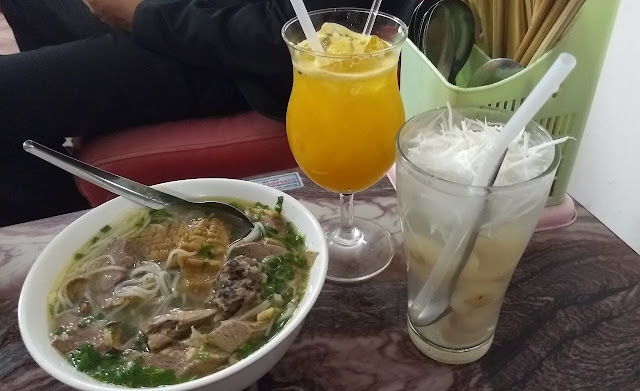 You have to order a drink if you want to sit inside, so we had one with lychee and coconut and one with passion fruit - both very good. 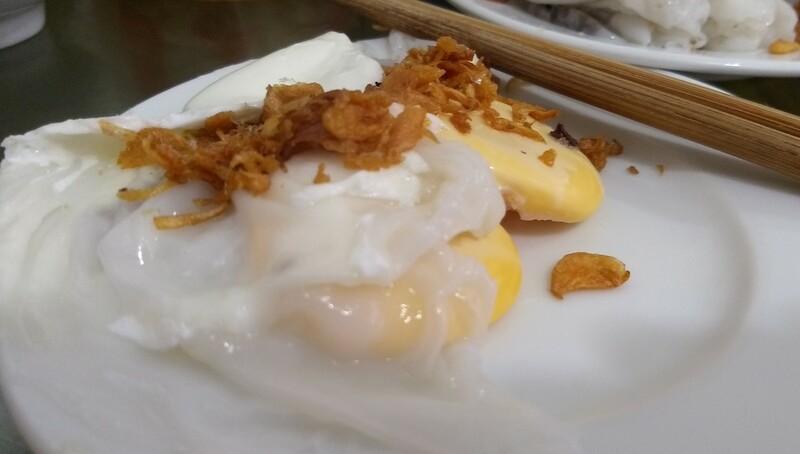 That was our first meal in Ngõ Trung Yên, but definitely not the last. 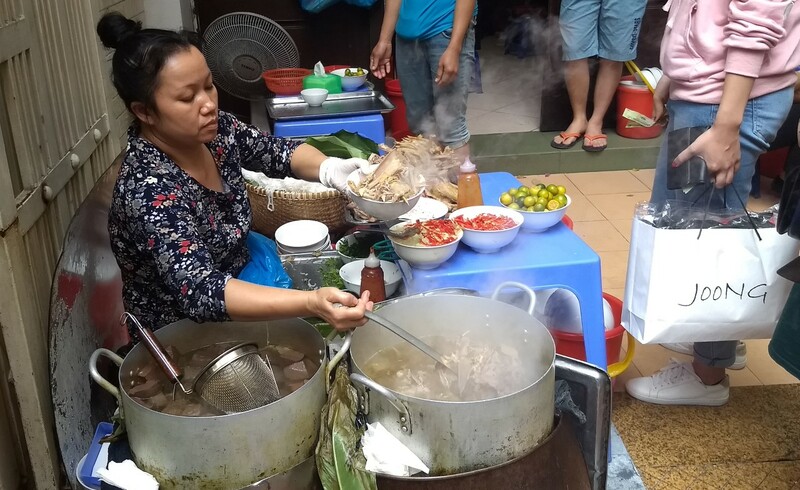 We dubbed it the "magical food alley" because of all of the good stuff in there. As is typical in Hanoi generally, what was going on in the alley depended very much on what time of day it was. 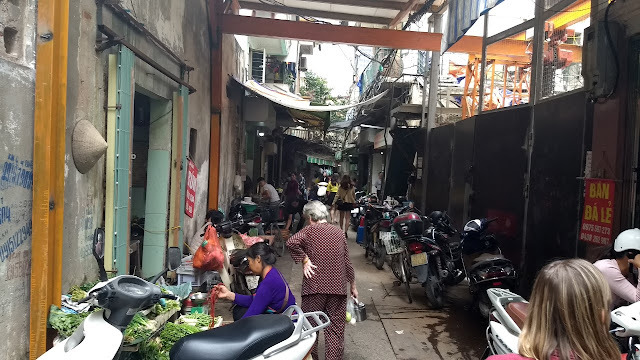 The duck lady ran from around 10:00am until early afternoon - come by at a different time and there was no trace she had ever been there or would be there again. 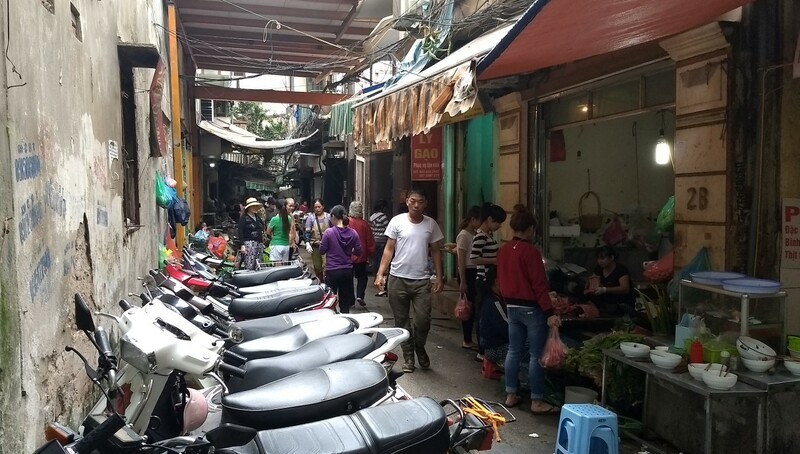 In the morning they alley operated as a small, but active market selling vegetables, poultry and meats. 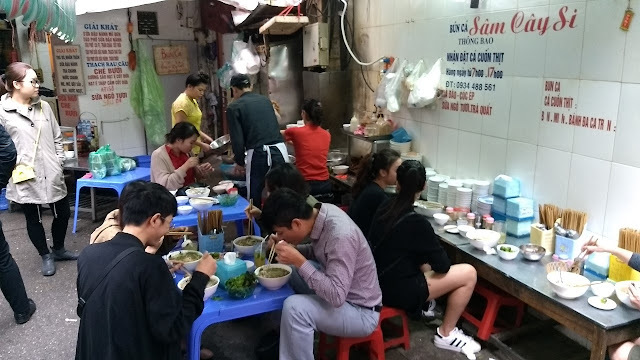 Another lunch-focused spot in the alley is Bún Cá Sâm Cây Si. 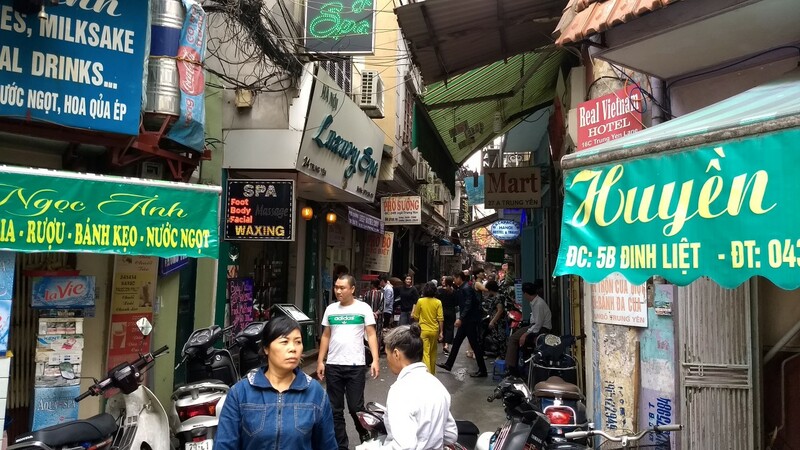 We passed it a few times, and eventually ended up there for a meal. 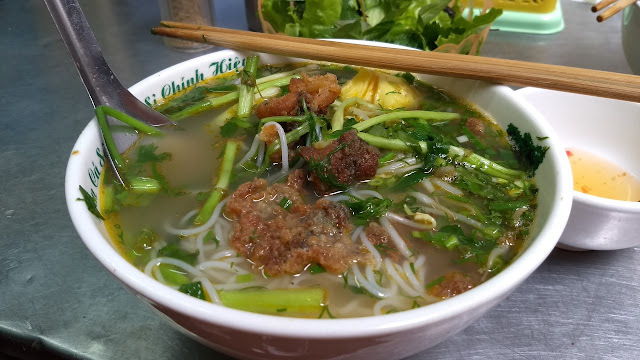 Bún cá is a rice noodle soup dish with fried fish pieces in a light tomato-infused broth. 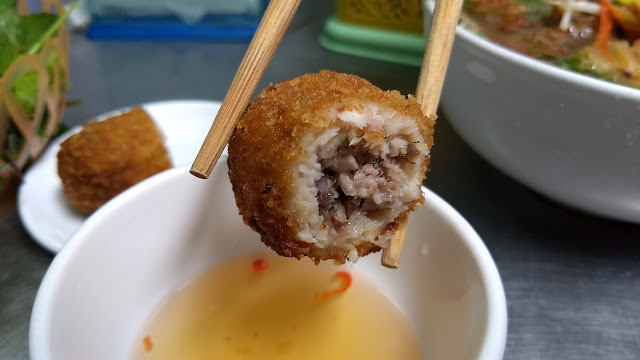 It was extremely good, as was the other item they sell, cá cuốn thịt - little fried rolls of pork and fish. The shop sets up in a little jog in the alley. 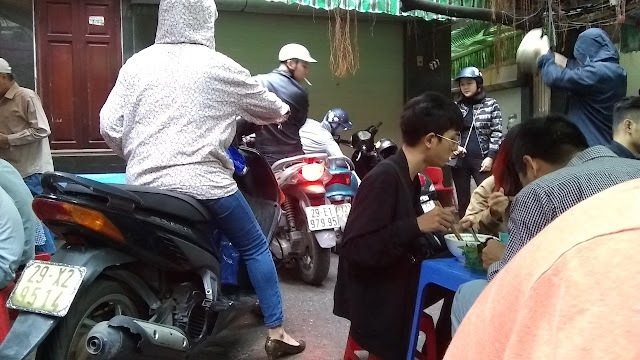 It gets pretty busy there, with the tables jutting out into the ever-present motor bike traffic. While walking through the alley one morning, we saw a lady making Bánh Cuốn (a steamed, rolled rice noodle dish). 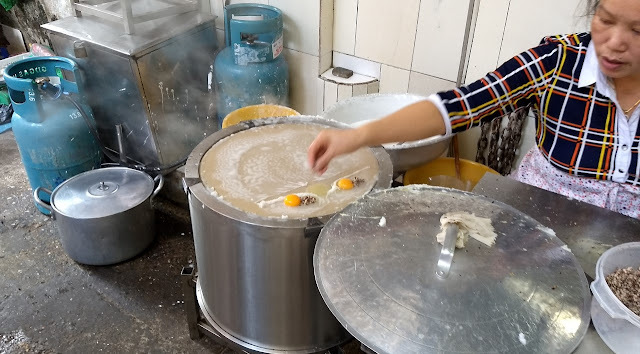 What particularly caught my eye was that she was cooking eggs along with the rice noodles - something I hadn't seen before. 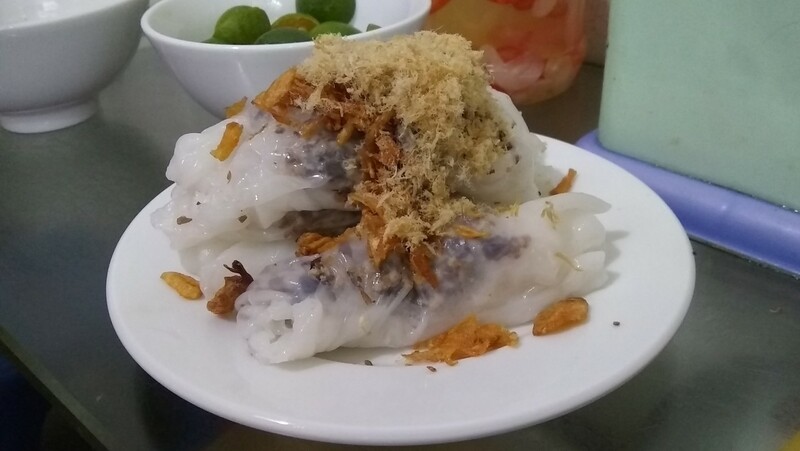 They were cooked through, but still had a nice soft texture and having them wrapped in a bit of rice noodle and topped with fried shallots made for a fun breakfast dish. If you visit Hanoi, do be sure to check out the "magical food alley" - you will not be disappointed.